The McKinley is an excellent home for busy occupants. The layout features 3 bedrooms, 2 full baths, and a two-car garage, as well as an optional home office or study for those who want to conduct business at home. It has a total area of 2,632 feet, which comes down to a finished area of 1,336 square feet. 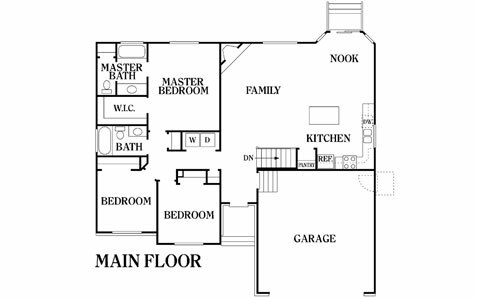 The master bedroom occupies its own corner of the home and has its own walk-in closet and a full bath. Parallel to it are 2 bedrooms, each with a wide window that opens to the front of the house. The shared full bath and the space for the washer and dryer are found between the master and the smaller bedrooms. The great room has provisions for an island kitchen and a pantry, and it features a nook leading to the backdoor. There’s also a fireplace in one corner, which can make any living area warmer and more welcoming. Trust Perry Homes Utah to make the process of constructing a home as seamless as possible. For more than 40 years now, our company has been building homes that families love living in. Aside from offering a variety of rambler and two-story homes, we also provide the assistance of a design center personnel who can help you decide the details of your home and make it more suitable to your needs. Start building your dream home today and make the process as painless as possible by trusting Perry Homes to do the job. You can count on our company’s excellent customer service right from the start until after you’ve settled into your new heritage home in Utah. Give us a call today at 801-264-8800.